Beauty lies within.' Indulge in a little Disney magic, with this enchanting Beauty & The Beast stacker ring set, crafted in sterling silver and rose gold plate with pink Swarovski® crystal for a sparkling finishing touch. Discover all the ways to express yourself with one of a kind jewellery that reflects your life and experience. 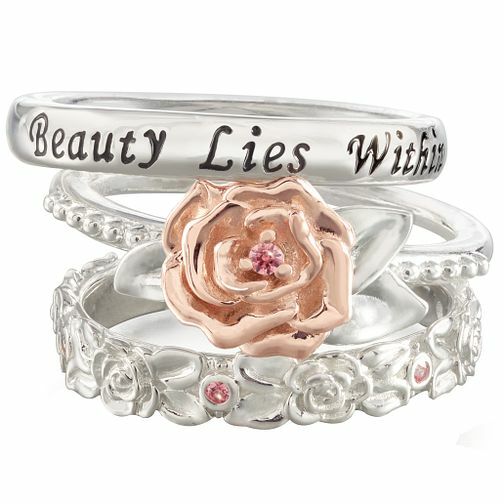 Chamilia Disney Beauty & The Beast Stacker Ring Set Small is rated 5.0 out of 5 by 1. Rated 5 out of 5 by Anonymous from Excellent Very good product and very good service! My wife loved it.